It is becoming better understood that we consume far too much of the essential fatty acid known as Omega 6, to the detriment of the other essential one – Omega 3. As with all things in nature both of these fatty acids are required in perfect balance to maintain a healthy body. They are called Essential because we cannot make them ourselves, we must get them from the foods we consume. Many people in the fields of science, biology, chemistry, nutrition etc, with far more credentials than I could ever hope to have – have written extensively on this topic. My whole intention in writing this short blog post today, is to bring to your notice a series of links to papers which expound on this subject. Before I post the promised links, perhaps (for the uninitiated) it will be beneficial to show, just where in our food chain, we get the Omega 6’s and the Omega 3’s. Yes I do know there are Omega 9’s, but at this moment they are not part of this discussion. Keep in mind that the Omega 6’s are known for their inflammatory effect, while the Omega 3’s are known for their anti inflammatory response. When consumed in the correct balance as nature intended they balance each other out. 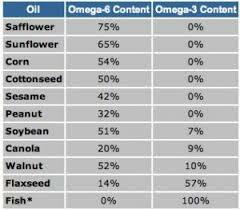 Generally speaking we find the Omega 6 fatty acids in seed oils, which are overly abundant in our food supply. The following list appears here. The Omega 3’s are found as most of us know in oily fish such as salmon, sardines and mackerel. There are also other Non-Fish sources as listed here. It is not difficult to see how easy it is, consuming the modern / standard diet, to get far too many omega 6’s at the expense of the omega 3’s. The SIXES are found in just about every convenience food on the planet and are heavily promoted as being ‘the best thing since sliced bread’ by health agencies worldwide. This has probably done a great amount of harm to all who typically consume what has become known as a SAD diet. We need to become super sleuths to discern where in our personal food chain we maybe obtaining the majority of our Essential Fatty Acids, and make the necessary adjustments for health and longevity. Now onto those promised links, which I assure you are well worth you perusing. From David Gillespie – Oils Ain’t Oils: The irony is that there is no such thing as oil from a vegetable. The products being sold as “vegetable” oils are in fact fruit oils (coconut, palm, avocado), nut oils (macadamia, peanut, pecan) or seed oils (canola, sunflower, soybean, cottonseed, grape seed, rice bran). While the fruit and nut oils are relatively harmless, the seed oils pose a real risk to our health – and unfortunately they make up most of the “vegetable” oil in our food. It is now almost impossible to buy a packaged or takeaway food that is cooked in anything but a seed oil, and while some seed oils are unhealthier than others, they all contain damaging levels of omega-6 fatty acids. From Prevention.com (Link) – Is Vegetable Oil Bad for Your Heart? : Despite the fact that they help lower cholesterol, the polyunsaturated fats in certain vegetable oils could still actually increase the likelihood of death from coronary artery disease, finds a new Canadian Medical Association Journal analysis of more than 20 studies. As a closing thought- Soy Oil is listed in those high in Omega 6’s. I have found it nigh on impossible to purchase any processed product in the supermarket that does not contain Soy or soy by-products. This oil/plant material is in food, sweets, desserts, pharmaceuticals, factory farmed fish, grain finished beasts sold for human consumption, bread and pastries too. Do your homework people, and see where you can reduce your intake of Omega 6, increase you intake of Omega 3, and attempt to bring your body back into a healthy balance as nature intended. Chris Kresser has some excellent articles on how you might achieve this and why it is so important. Look Here. Till next time, read, research and be a super sleuth… all for the best possible health you can achieve. This entry was posted in Fast Food, GMO's, Government Health Edicts, Grains, Heart Disease, Holistic Health, Indoctrination, Industry Shenanigans, Inflammation, Lies, OIL's, Omega's, Polyunsaturated Fats, seed oils, Silent Inflammation, SOY, Unhealthy Food, Unhealthy Processed Foods and tagged Dr. Rath, Inflammation, Mis-information, Omega 3, Omega 6, Polyunsaturated Oils. Bookmark the permalink.